Sunshine Optics is pleased to offer a wide variety of Anti-Reflective coatings to meet your needs. From the basic to the high-end, we’ve got you covered. Indigo™ features selective blue light blocking technology that helps minimize high-energy blue-violet light thereby reducing digital eye strain and visual discomfort caused by harmful blue light. Indigo™ also provides protection against scratches, dust, moisture, smudges, and back-surface UV reflections. Indigo™ AR is a premium choice for our customers for addressing digital eye strain associated with Computer Vision Syndrome, the number one computer-related eye health complaint in the U.S. We include the premium SD2 dipcoating with Indigo AR to ensure the best adhesion for durability. Aura™ ultra-premium AR lenses provide extraordinary clarity, long lasting performance, and a whole new level of scratch resistance to help combat any potential lens damage caused by daily wear and tear, exposure to intense conditions and strain of continuous cleaning. Stainless LUV™ is our top-of-the-line premium AR coating that includes all the features of today’s best anti-reflective lens treatments. super-oleophobic AR lenses provide increased scratch resistance, offer unparalleled anti-static properties and address AR coating’s number one consumer complaint: Cleanability. 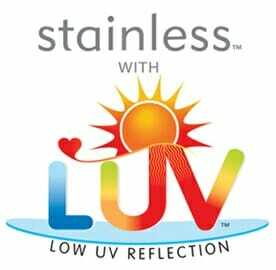 In addition, Stainless™ with LUV™ provides advanced UV reflection protection. Stainless combines our DHC thermally-cured dip hardcoat process, ion-assisted AR stack, super slick top coat, and a newly developed back-surface UV reflection protection technology. In fact, the leading source of industry testing has shown Stainless to be one of the most scratch-resistant, easy to clean AR products available anywhere. Vivix™ anti-reflective technology provides reduced glare and reflection allowing more light to pass through the lens and reach the eye. Vivix also provides increased scratch resistance to help enhance the longevity of your eyeglasses. The result is an advanced AR product with maximum customer satisfaction. Vivix is almost the same as our Stainless premium AR coating; the only difference is in the final layer topcoats. Fusion 5 XTO™ is a revolutionary development of the Fusion 5 process that combines the latest technological advancements of premium anti-reflective application that results in a more durable, slicker, easier to clean anti-reflective product. It’s an affordable, durable, basic AR coat that can be applied to any lens. Topit™ is designed to answer the demand of a quality super oleophobic AR treatment on edged lenses. This has engineered this product with an ultra slipperiness, so only already-edged lenses can be coated with ultimate super smooth AR product. Topit can be applied to any lens style, material or substrate, including all glass lenses. SD2 is our premium thermally-cured dip-coat treatment for all lens types. This offers the best resistance against normal wear-and-tear scratches and extends the standard factory scratch warranty. SD2 with No-Fog combines our thermal-cured hard coating with anti-fog treatment, and comes with rejeuvenator lens cloths to help maintain the anti-fog properties for the life of the lens. Premium Mirror Coat are available in either solid or flash densities, and come in an assortment of fashionable reflective colors. With an exclusive double-sided thermally-cured hardcoat, a Bayer rating in excess of 7, a backside Stainless AR with LUV™ (Low UV reflection) technology and a premium oleophobic top layer, Ice is the premium mirror coating available today. Each pair of Ice lenses is guaranteed against cracking, peeling, crazing and scratching. A sample kit of available colors can be ordered from Sunshine Optics.